Kearney hosted a workshop on leaffooted bug monitoring, damage to tree nut crops, and management strategies. On May 10, 2016, Kearney researchers, Kris Tollerup, UC ANR cooperative extension advisor at Kearney Agricultural Research and Extension Center, specializing in Integrated Pest Management (IPM) for almond, pistachio, tree fruit and grape crops; and Themis Michailides, UC ANR plant pathologist and lecturer in Plant Pathology at UC Davis and Kearney Agricultural Research & Extension Center, conducted a workshop to help attendees learn more about leaffooted bug monitoring, damage, management, and its involvement in spreading Bot of pistachio and other diseases on pistachio and almond. Tollerup discussed the different Hemipteran pests (leaffooted bugs and stink bugs). A PowerPoint handout was provided. The handout covered what the bugs look like; the stages of the bugs' growth; diagnostics for identification; the host crops; overwintering, what the damage to almonds and pistachios looks like; when the damage occurs; what we know, and what we need to know. Michailides concluded that the disease in almonds caused by insect damage “is a new disease of almond and it is very similar to the stigmatomycosis reported on pistachio.” Early insect damage can result in the nuts dropping from the tree and later damage can render part of the crop unmarketable due to decay and black spots on the kernels. The photograph shows: Infection of pistachio fruit by Neofusicoccum mediterraneum (initially identified as Botryosphaeria dothidea, thus the name Bot of pistachio disease) initiated from insect-punctured fruit and spread into the main rachis of the cluster [A and B; note a leaffooted bug (Leptoglossus clypealis) on the rachis of pistachio cluster in B]; C, fruit infected by the pathogen and covered with pycnidia surrounding the sap exuded from the insect's injury; D, fruit infections initiated from injuries caused by birds and spread into the main rachis of clusters. 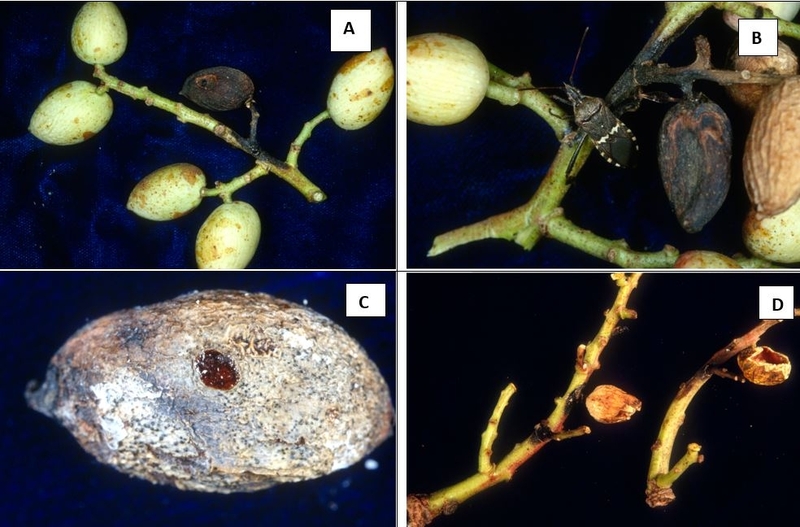 Infection of pistachio fruit by Neofusicoccum mediterraneum (initially identified as Botryosphaeria dothidea, thus the name Bot of pistachio disease) initiated from insect and bird damage.